You will be given a reference e-book to read which has 244 pages And the test will be based on that e-book , you can take final test within 1 year of purchase. Wind energy refers to a specific kind of energy which is mainly created with the help of wind. It utilizes wind as a means of generating power. It also refers to a kind of kinetic energy which you can easily transform into electricity or mechanical energy. Numerous kinds of wind generators are now used in acquiring wind energy. One of the most commonly used kinds of wind generator is the windmill. Originally, this generator is developed to help in pumping water designed for farming. It mainly comes with a tower which has multi-bladed rotary engines. Wind is used in turning blades and pump water to create power. Aside from pumping water, windmills are also useful in grinding spices, tobacco and grain. Another effective wind energy generator is the wind turbine which refers to a modern wind machine which takes advantage of huge blades in generating electricity. Wind turbines are usually composed of blades mounted in an installed turning shaft. This turning shaft comes with gear transmission box which is used in increasing the blades’ speed. It is necessary to attach the transmission box into another shaft to get a kind of generator which works in producing electricity. These turbines are effective in powering homes, pumping water and charging batteries. What makes the act of using wind energy beneficial is that it is renewable and does not cause any water or air pollution. The wind energy certification program which is now introduced by Brainmeasures to the public is one of the most ideal online certification courses for you especially if you have a strong desire to become an effective certified wind energy expert. This wind energy course is professionally created by experts so you have a hundred percent guarantee that it can help you in mastering all the relevant aspects related to the wind energy field. Brainmeasures gives you the chance to undergo a kind of wind energy training which highlights all the essential concepts related to the field, the different wind machines that are now used in generating energy and their individual components and the major benefits provided by wind energy. Deciding to enrol in this online certification course is one of the many decisions that you will never regret since you can receive a certificate which works in proving to the whole industry that your adeptness and skilfulness in using wind energy is remarkable. How to take advantage of wind energy especially in conserving energy? How to effectively distribute the speed of wind? 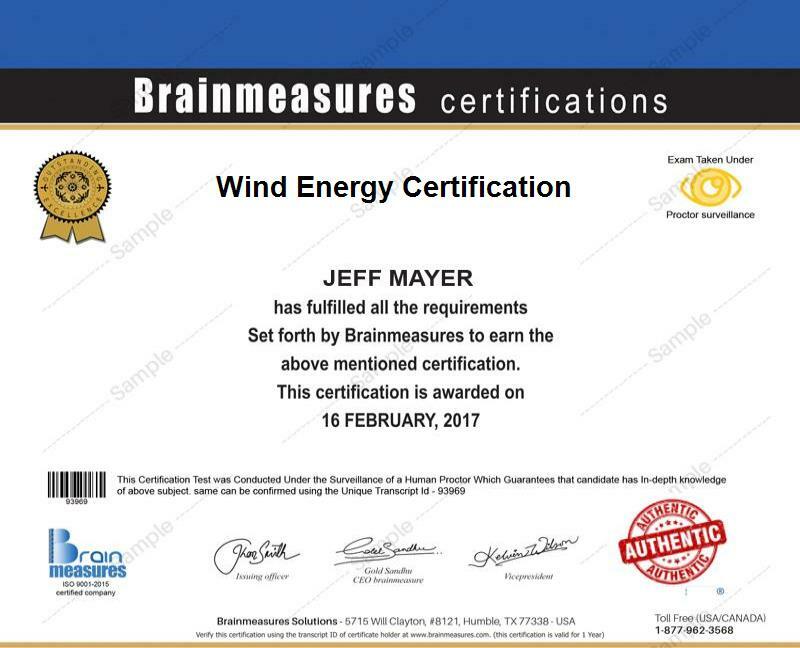 The wind energy certification program which you can now access at Brainmeasures is proven to be really beneficial to hundreds of individuals and professionals. You can expect it to work for all aspiring and existing professionals whose daily responsibilities require a deeper understanding about wind energy including wind energy analysts, project managers, engineers, development managers and technicians. Finishing up a wind energy certification course is also something that you will never regret considering its effectiveness in increasing the level of your salary. With the presence of your wind energy certification, working as a wind energy analyst will become easier and this will let you enjoy around $65,000 to $95,000 every year. Your certification is also a huge help in your attempt to work as a wind energy project manager which can reward you with an annual pay of $72,000 to $104,000.